The sheltered Thompson Cove Beach. The beach here is not great and getting to the beach is difficult due to accesses being blocked. Found between Babalua Beach and Blue Hills Beach, this is a very small coast located near the entrance canal into the residential area of Thompson Cove. 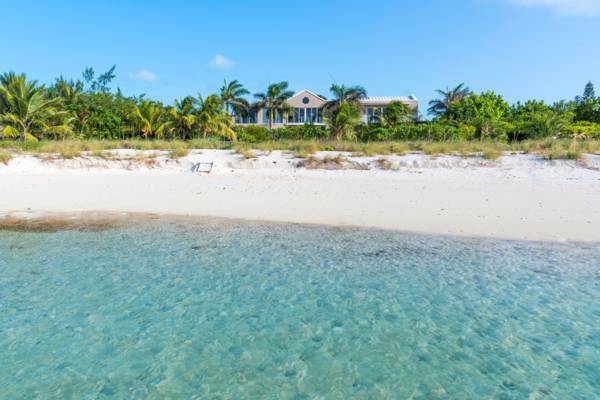 Almost the entirety of the north coast of Providenciales consists of beach, and this coastline is only interrupted by the entrance canals into Turtle Cove Marina and Thompson Cove, and the coastal cliffs fronting the nearby Blue Mountain area. Several rental vacation villas are found in Thompson Cove which tends to be a very quiet neighbourhood, although centrally located. Thompson Cove beach isn’t great for swimming as the water has is shallow with lots of broken coral, sea urchins and sea grass. There are some snorkelling sites out a few hundred feet, but the superior Smith's Reef is a far better choice in terms of underwater sights. Coast engineering in the form of rock jetties and groynes has taken place at several locations fronting residences, and these have created small beaches that are a bit larger and more-consistent than the natural beaches. When in the water, be aware of boats entering the canal. The waterway sees very little traffic, yet it’s best to watch for vessels. All old beach accesses have been blocked off. To get to this Thompson Cove Beach, it’s necessary to walk up the coast from adjacent Blue Hills Beach.